Women face significant risks across the life course. Women earn less than men, and they are more likely to be in low paid and insecure work. There is an unequal division of caring responsibilities, with women being more likely to be caring for children, for adults, and often both. Women face distinct health risks, and they are more likely to report having suffered from mental health conditions. Women are more at risk from domestic abuse, including domestic violence and financial coercion. Women live longer than men, but they tend to have far lower levels of pension savings. Women require care for a longer period at the end of life, and they face considerably higher care costs as a result. 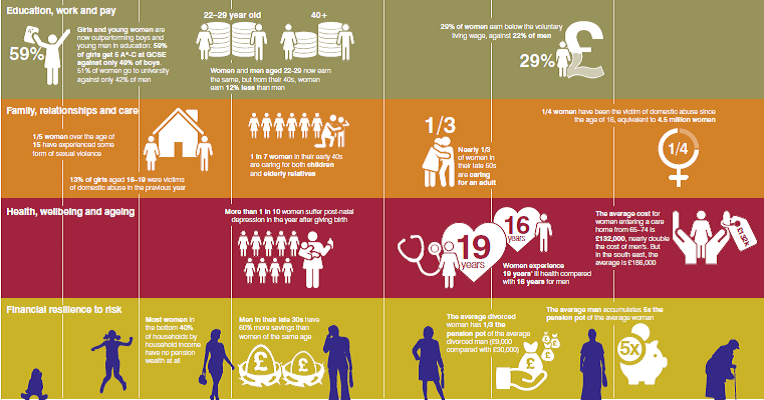 A new interim report published by The Chartered Insurance Institute presents a snapshot of women’s and men’s risks in life in Britain today, and their resilience to shocks and preparedness for later life. It is not focused on specific insurance or financial products or services. Rather, it takes a holistic view of life risks in society today, and seeks to glean a better understanding of women’s risks and their exposures. By doing so, it highlights the potential scope for the insurance profession to play a greater role in protecting women, and society as a whole. Risk & Wellbeing – Health, wellbeing and ageing. The report also highlights women’s potential risk exposure, which is measured with reference to their financial resilience – that is, the ability to withstand the impact of risk. The main components of resilience considered are: access to savings, pension savings, assets (excluding property), stable income and absence of debt. Finally, the Report considers Attitudes and approach to risk, among both women and men. For more Reports on Gender, Diversity and allied subjects, visit our searchable Knowledge Bank.